W.J. Niederkorn Library is a part of Monarch Library System, which is comprised of the libraries in Ozaukee, Sheboygan, Washington, and Dodge counties of Wisconsin. Your W.J. Niederkorn Library card may be used at any of these libraries (some limitations may apply such as needing to physically travel to certain libraries in order to access their specialized databases). In general though you may check-out and return materials to any of the libraries in the system; your W.J. Niederkorn Library card may be used at all of them! The Library Board meets on the 3rd Friday of the month at 8:30 am in the W.J. Niederkorn Library Community Room. Agendas/minutes can be found on the City of Port Washington website. Due to the Port Washington Woman’s Club’s (PWWC) determination in 1898 to inspire the community through reading, we are fortunate to have library service in Port Washington since the creation of the library in 1899. The concept of a public reading room became the impetus for the first library in the back of the Courtland Drug Store on the SW corner of Franklin and Main. The first librarian was Edgar Smith, the druggist. The library was a joint effort between the City of Port Washington and the PWWC. By 1908, the basement of the Courthouse provided much needed space. Six hundred borrowers frequented the public library in 1912; 294 of them were children. The PWWC and the city paid the librarian’s salary of $300. After a move to City Hall in the 1920’s, the first library board was created. A building fund in the 1930’s changed the location of the library to the Wisconsin Street School where it resided for 30 years. In 1961, donations from William James Niederkorn made possible an independent library, which is now the W.J. Niederkorn Library. 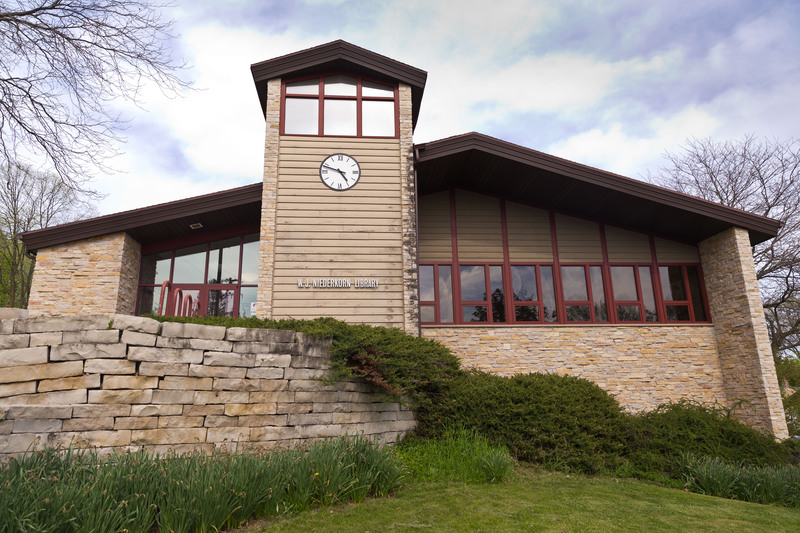 In 1999, the library celebrated the determination and foresight of the Port Washington Woman’s Club a century ago by creating a public reading room in a stand alone and grand building. The W.J. Niederkorn Library expanded in 2001 with an addition that doubled the size of the library. Incorporating and complementing the design elements from the 1961 building, the new building rests beautifully at the bottom of N. Webster St. and W. Grand Ave. hills. In 2011 the W. J. Niederkorn Library celebrated its 50th anniversary in its location on Grand Ave. The Friends of the Library continue to carry on the solid tradition of outside support and partnership with the library. None of the buildings built in the nineteenth century as public schools by the Village and later by the City of Port Washington now survive. The first public school that served Port Washington was a small brick building built in 1845 and located on the southwest corner of W. Jackson and N. Wisconsin streets (non-extant). This school later also served as the City’s first high school, starting in 1881, but it was razed in 1892 when the new Wisconsin Street School (non-extant) was built on the site as a combined elementary and secondary school. This $20,000 Richardsonian Romanesque Revival Style-influenced school, however, was eventually itself superseded when the new Port Washington High School (427 W. Jackson St.) was designed in the Tudor Revival Style by the Green Bay architectural firm of Foeller, Schober, and Berners, whose original portion was built in 1930-1931. The old Wisconsin Street High School building meanwhile was destroyed in a fire in 1982. Learn more about the history of Port Washington via the Port Washington Historical Society.